Cross Rod Spacing and Alignment: Cross rods should not vary more than 1/8 in 12 in either direction from perpendicular alignment with bearing bars. 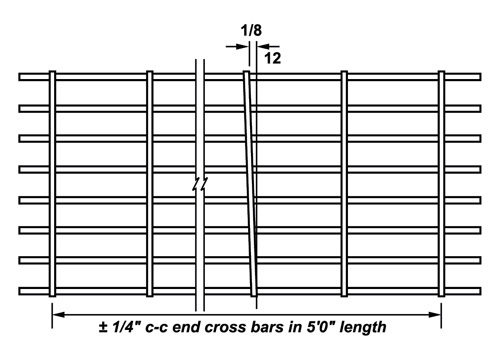 The tolerance of the cross bar spacing for 5’ in length is ±1/4”. Cross Rod Position: The top of the cross rod should not project more than 1/16” above the top of the bearing bars for standard grating (1/8” for heavy-duty) and should not extend more than 1/8” from side of bearing bars. Bearing Bar Lean: Bearing bar lean must not exceed a slope of 1-1/4 to 12. Cross Bar Lean: Cross bar lean must not exceed a slope of 2-1/2 to 12. 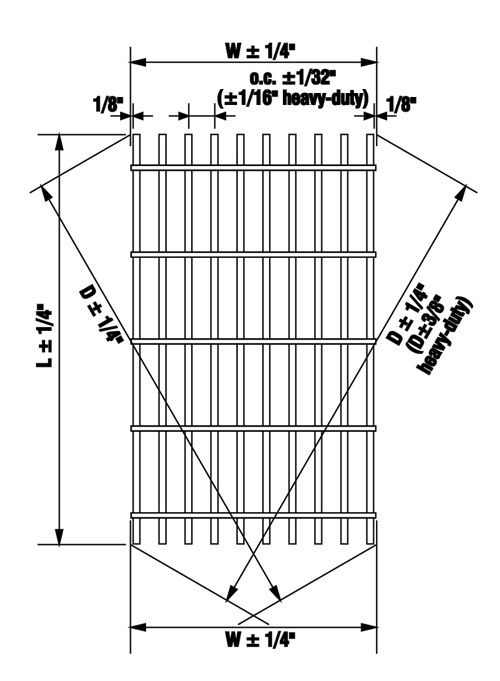 Longitudinal Bow: Longitudinal bow should be less than 1/200 of the length for standard grating (1/240 for Heavy-Duty). Tranverse Bow: Before banding, the tranverse bow should be less than 1/8” per foot of width.